Life sure changes when you begin to dance in step with the Dark, using your god-given dark abilities and skills. For example, life becomes more fun because you don’t get as frustrated since you are aware that you have the right to speak up and stand your ground. Though it would take a book to define all the ways that you change when you begin living your life using your dark skills and abilities, here’s a few of the more noticeable changes. Since one of the major purposes of Dark Power is protection, it only makes sense that the first thing we do protect ourselves better. I don’t mean throw up walls. I mean setting boundaries that are flexible and breathable. Boundaries are limits that you set on how much energy you will expend. People with healthy boundaries are healthier and more emotionally resilient than those without them. When you have healthy boundaries you have plenty of energy and don’t get that scattered, fuzzyheaded feeling caused by other people draining your energy. Boundaries are self-love in action. 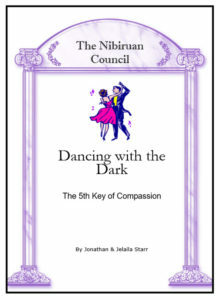 As explained in Agreements, the 6th Key of Compassion, an agreement is a verbal or written arrangement by which a designated set of needs is fulfilled. Just as boundaries are self-love in action, agreements are self-empowerment in action. Agreements are what responsible, self -empowered people use to communicate their needs and ask for what they want. People who use agreements are empowered and find it easy to trust and feel safe in their relationships. As a result, they are able to commit on a much deeper level, and therefore enjoy the rich satisfaction of a strong and emotionally satisfying relationship. A relationship built on the self-empowering foundation of agreements is a relationship that feeds the soul and makes the heart sing. It is the kind of relationship we all desire in our lives. An agreement is also a promise to fulfill the needs designated in the arrangement, thus when we create agreements our integrity comes into play. In fact, the power of the agreements to create the desired outcome, a happy and fulfilling relationship, is directly proportionate to the integrity of the partners. In other words, does your word mean anything? Is it a matter of honor or not? To what length are you willing to go to keep from breaking your agreement only because you said it would be so? An agreement is not a rule. Rules are made to be broken because they are based on a win/lose principle. Rules also tend to empower only one side while disempowering the other. Once we come to understand this God-conscious concept and add agreements to our existing relationships, we will see the magic of their power to heal, nurture and bring back into balance what could not be balanced in our relationships no matter how hard we tried. Here’s a heart-warming example to explain what I mean. Jonathan and my then 10 year-old daughter Danielle were not getting along after I moved to LA. Danielle had been living with her father for the past 2 years and after a lengthy court battle that ended in late 1997, I was not willing to battle him again in order to take her with me, plus, I felt that only time apart could break the co-dependent attachment between Danielle and I. Being too young to understand, Danielle just felt abandoned and hurt. Her pain and anger were enormous, and not having any supportive authority figures, (her dad believed that anger should not be expressed) she didn’t have a way to work through it. Additionally, she didn’t want to risk losing me entirely if she vented the anger at me, so she expressed it at Jonathan, someone she felt she could risk losing. Danielle’s first visit was an emotional disaster. She and Jonathan fought daily, each complaining to me about the other. I felt I was being torn in two as each sought to gain my support against the other. Of course I allowed this by not having set any personal boundaries or negotiated any agreements for it. As the days went by, I found myself counting the days until she went home. As much as I loved being with her and knowing how much my heart would break as I watched her walk out of my life again as she boarded the plane in the care of a stranger, I knew I could not take many more. Danielle’s second visit was no different. At the end I sat crying in the airport as I watched her plane take off and fly into the sky headed east to Kansas City, 1700 miles away from me. Once again, I had taken her to the airport alone. Driving home, I began to realize that my fear of marrying a man who did not love my child had been realized, and I was responsible for its manifestation. In January, 1999, Danielle returned for her third visit. This time I was ready to make a change. The morning after she arrived, we went into the office and sat together at the computer to create a set of agreements. It was easier than I thought. As we discussed them and I typed them up, I began to see that they were much different than the rules I had used with Danielle when I was still single, and of course, which she constantly managed to forget and break. When we were done she asked to go out and play. I felt somewhat let down. I had expected some big magical change to suddenly take place and yet there was nothing, just a child anxious to go and play with her friends. Two hours later, she returned and asked to renegotiate one of the agreements. This in itself was wonderful. It meant that she realized that she had power but that was not what really struck me. It was her demeanor and the tone of her voice. In two short hours she had transformed from a clingy 5 year-old to a self-assured 10 year-old. I couldn’t believe my eyes and ears! Danielle had grown up! I realized that by creating the agreements with her, I had given her back her power and a real sense of safety. Now she felt empowered in her relationship with Jonathan and me. Danielle now knew what was expected of her because it was written down. No more walking on eggshells. And she also knew that if an agreement was not working for her, that she had the power to renegotiate it. And most of all, she knew that her power was equal to ours, that we all lived by the agreements, not just her. Five long months went by before Danielle returned. This was to be a month long visit and a real test of our newly created agreements. Not only did they stand the test, but they worked their magic on the wound between Danielle and her stepfather. They had their conflicts and one night got into a big one. When Jonathan grilled Danielle about something she did not do, she stopped him with the agreements. She said, “I’m not going to continue this because you’ve gotten me confused.” And with that she walked out of the room. I thought to myself, “Touché´! You go little girl!” Danielle had stood up to her step-father. A few days later, as they were standing on the balcony watching the Fourth of July fireworks light up the city below, Danielle turned to Jonathan and said, “Dad, I want to thank you for teaching me how to stand up for myself. I was scared at first, but I’m proud that I did it.” Jonathan replied, “Thank you. You did a good job Danielle. I know it was tough, but you did it.” With that they embraced and the wound between them healed a little more.